Keeping true to their personalities, Sydney and Kyle's "Southern Charm Prep" wedding brought classic summer flair, highlighted by a coral and navy palette. As both of us grew up in Central Kentucky, we have many memories at Keeneland, and knew if we held our wedding at Keeneland it would be amazing...We truly couldn't have imagined our wedding any differently. To complement their theme, the couple crafted a custom menu with Keeneland Hospitality highlighted by a mix of chic and southern selections. Guests were treated to an array of hors d'oeuvres including Country Ham Biscuits, Crudite Shooters and Mini Hot Browns. Friday, September 4, 2015, LEX 18 News at Sunrise started just like any other day. When it came time for the Fun Fact segment, Sydney (Sunrise Producer at LEX 18) was a little nervous, hoping that everything would go smoothly with the behind-the-scenes control room staff introductions. Once the segment began, the anchors introduced the crew and then announced they had an ulterior motive for planning the segment and a guest was in the building. At that moment, Kyle walked through the door, got down on one knee and popped the question. To make the moment even more special, Kyle had arranged for Sydney's family and puppy to greet them in the next room. The proposal was more than Sydney could have ever imagined and the best surprise ever. How did you choose your wedding cake? "Who says you can't have your cake and eat it too? For us, one cake was just not enough – we had three! My dream for our bridal cake was for it to resemble my wedding dress. The five-tier beauty had butter cream pearls, a rhinestone belt and who could forget the fondant bow in the middle. Our groom's cake looked just like a bourbon barrel and was topped with golf balls and a Centre baseball cap as a nod to Kyle's love for the games. Our third cake was so fun! My two-year-old Maltipoo, Bella, was the ring bearer for our wedding so we couldn't leave her out. Each of our cakes had different flavors and they were all magnificent. Tinker's Cake Shop could not be beat." Why did you choose Keeneland for your big day? "When we visited Keeneland, the staff was so welcoming and friendly. 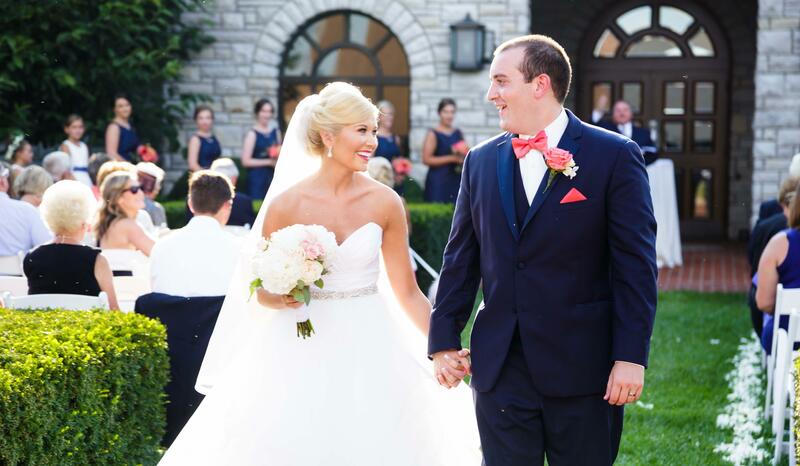 As both of us grew up in Central Kentucky, we have many memories at Keeneland, and knew if we held our wedding at Keeneland it would be amazing...We truly couldn't have imagined our wedding any differently." "From our navy and coral colors, to the wooden pallets for the seating charts, our favors, even our guest book being a pallet bench that Kyle made, everything was absolutely perfect." What advice do you have for future brides and grooms? "My advice is to enjoy every second of the process. So many times you can get caught up in all of the stress or thinking about what everyone else might think, but this is your time! This is the one true time that everything is all about you and the love of your life. Embrace it and have fun!"